West Brom's Saido Berahino says he has chosen not to pursue legal action against team-mate James Morrison after being punched by the midfielder during a dressing-room incident last weekend. The England Under-21 striker considered pressing charges after the row which followed their 3-3 draw with Cardiff. 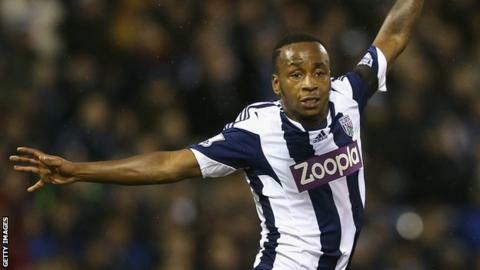 But the Baggies later said Berahino, 20, was now fully focused on Saturday's game with fellow strugglers Norwich. The BBC understands the player remains unhappy with his club's stance, though. Berahino was left with facial injuries after the dressing-room clash at The Hawthorns. West Brom have played down the row, and no disciplinary action has been taken against any of the players involved. Berahino, who scored 10 goals in seven starts for West Brom and England's Under-21s last autumn, has made only three starts under new Baggies boss Pepe Mel. Morrison, Albion's longest-serving player, has made 198 league appearances since signing from Middlesbrough in 2007 for £1.5m. The Scotland midfielder has played 29 times this season for the Baggies. Albion are currently one place above the Premier League relegation zone and travel to Carrow Road this weekend.